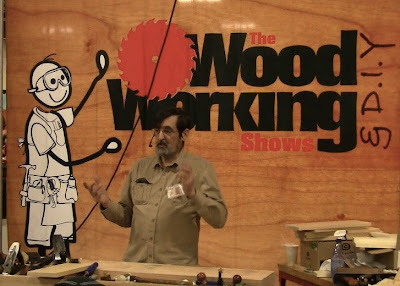 Paul Sellers doing a Masterclass presentation at The Woodworking Show, Springfield. Yesterday I went to The Woodworking Show in Springfield, MA. It's primarily a power tool show, with only a few hand tool vendors and presenters. However, what made it entirely worthwhile was the chance to meet Paul Sellers. He was giving Masterclass presentations every 2 hours, and selling his Working Wood DVD and book series (which I reviewed recently). I sat up front for his first presentation. I've seen the other show presentations he has on YouTube, making basic dovetail joints, and this was just as outstanding. 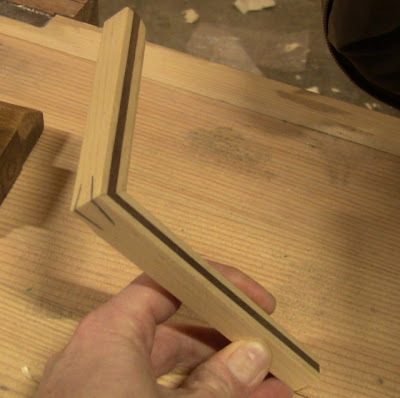 For this show he's added raising a basic panel, and making one joint of a walnut-inlaid picture frame. Dovetail demonstrations have almost become passé. Everybody does them, but I found the picture frame really spectacular. Everyone in the audience was amazed (make no mistake, they were equally impressed by his dovetails). Part of it is that he works very fast. As he says, "I've got the frame done, and you're still setting up your router and putting on your dust mask and hearing and eye protection." People got the message that with just a few basic tools and some skills, you can do good work quickly. The frame is made from two simple boards of pine and walnut. In minutes, he molds the pine edge, grooves it, molds a walnut strip, puts it in the groove, rips the piece off the board, saws out the rabbet, cuts and shoots the miters, and assembles the joint with walnut splines. The finished piece is tight and crisp even without glue. Add glue and it will hold for centuries. While this was only one corner of a frame, it wouldn't take much longer to do the whole thing. He cut the miters freehand, with no guides of any kind, then held one up to the 45 on a small Starrett combination square and walked it around the audience. It was perfect as far as we could see, even before shooting. One of the important points he made is that he has trained his body, his arms and his hand-eye-coordination to make these cuts through repeated practice. We tend to assume such precision is not humanly possible, but it is. I liken it to a violinist who has trained his hands to find the notes on the strings, without frets or levers or any other guides. Paul's picture frame corner. The dovetail saw kerfs with splines lock the joint mechanically. It holds together even without glue. There were two interesting bits of tool detail. First, I noticed that Paul is constantly adjusting the depth of cut on his plane to the task at hand. Need a deep cut? Flick of the adjuster wheel. Fine shaving? Flick it back the other way. I asked him about how easily his adjusters turn, he said to make sure you clean the threads thoroughly so it only takes a little finger pressure. Second, he pointed out to the audience that he sharpens the first inch of his small ripsaws with a passive rake to make starting the cut easier, then progressing to an aggressive rake. This means the cutting edges of the first teeth are actually at a trailing angle, like crosscut teeth. You can see that in the detail picture of teeth in this post on his blog. This also allows a small ripsaw to make crosscuts. He gave me permission to film him making the picture frame at the next session. I've included the panel raising at the beginning. I had also meant to include a segment where he had shown someone how to make a miter shooting board after the first presentation, but I didn't hit the Record button on my camera. By the time I realized my mistake, he was almost done. Like I said, he works fast. The microphone didn't pick up his voice very well over all the background noise. I've replaced the sound of screaming routers with music; for brevity, I've edited out spots where he paused in his work to talk. During this second session, I noticed a man and his teenage sons in the audience. One of the boys was straining to see more, and at one point got up and leaned over the front to see something more closely. He was clearly hooked. When Paul asked if anyone had questions after doing a quick run through of his sharpening method, he asked if the process would work on water stones, so he clearly had some hand tool experience. It was good to see a teenager with that interest and knowledge. What a pleasant surprise to find at a show that's primarily about power tool techniques. It's an impressive demo, and you did a GREAT job producing the video. Using the music instead of all of the raucous background noise was brilliant. Thanks for bring it to us. Always a pleasure to see Paul Sellers work. Really something to aim for, his skill that is. Thanks for taking the time to film it. It seems like Paul was better equipped for the show up there than the Baltimore one. I'll have to ask him about shooting boards as he didn't have one with him. I was at his first talk on Sunday, and it was worth the price of admission. The picture frame was amazing, I agree. I bought a copy of the book while I was there -- I couldn't afford the DVDs -- and have read through it already. For anyone who's thinking about buying it, it's worth the cost!